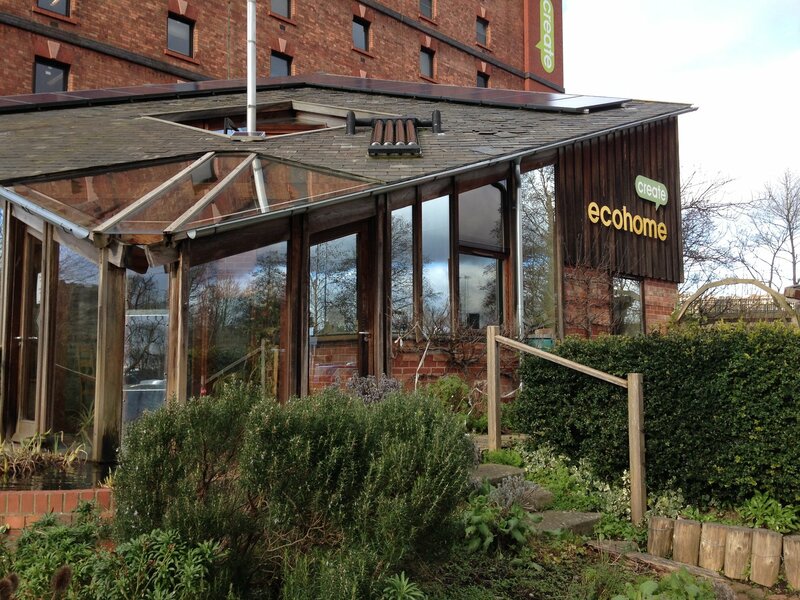 Inspired by Bristol's new accolade of 'European Green Capitol 2015' I decided to check out more of what the city has to offer and made a visit to the model Eco-home at the Create Centre. Create is located on Bristol's Spike Island, home to Aardman Animation and numerous creative enterprises. The Centre is surrounded by the impressive architecture of three former factories with Brunel’s suspension bridge as a backdrop. An environment centre housing a library of reference material for the environment, exhibitions and gallery as well the Eco home. I came across the Eco home while on a Sunday morning run. From snatched glances I saw it had a flat sloping roof, small shed with green roof and a small productive and ornamental garden surrounding. I learnt that the very shape and positioning of the home have ecological benefits. The cube shape conserves more heat than a traditionally shaped home. Facing south the sloping roof maximises exposure to sunlight, along with a higher proportion of glazing on these elevations. Due to the construction of the home, the sloping roof, glazing and material choices, the bedrooms are located downstairs and the living space upstairs. There is a wealth of information in the home including architect's drawings, material samples of insulation and blocks and wall cross-sections to demonstrate their construction and insulation. We are aware now of the great benefits of wall insulation but it was an eye opener to read the cost savings. Based on a three bedroom semi-detached house annual showed an annual saving of £380 for internal insulation, and external at £400. By insulating this type of property around 2,000kg of carbon dioxide would be saved. External insulation of walls, for older houses with no cavity, consists of adding a decorative, insulating treatment to walls. Thickness ranges between 80-140mm and may need planning permission. Outside in the garden ideas included rainwater harvesting, which at its simplest is the collection of rainwater from roofs into water butts. Paving was in the form of clay pavers that are permeable allowing water to filter down gradually into the ground rather than allowed to run off hard surfaces and into drains. SUDS (Sustainable Urban Drainage Systems) looks to better manage drainage by a number of means In the garden this could be in the form of permeable paving, a green roof on a shed or building, or by rain gardens. Rain gardens are formed by creating small depressions in the ground, these are then planted and roof water or water from paved surfaces can be diverted to these areas and filter into the ground as well as being absorbed by plants. 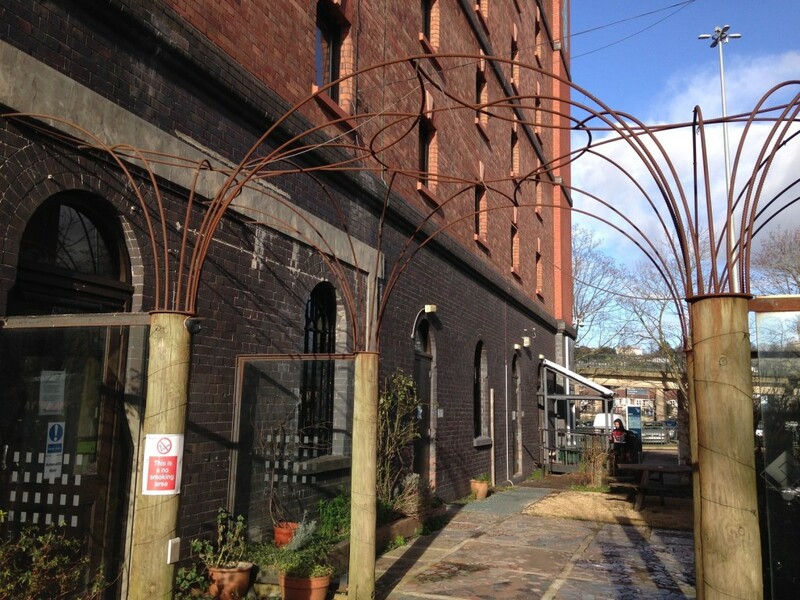 As I turned the corner of the building I found an attractive pergola structure constructed from weathered steel, used in the building industry for reinforcement. The steel had been bent to form gentle arches which was very effective and in keeping with the industrial feel of the surroundings. Strawberry plants were nestled into available space next to the quaint shed with its green roof of sedums. Numerous herbs featured included Rosemary gave some evergreen structure through the winter months. I'm keen to return to the garden as the year progresses as it'd be fabulous to see the small fruit trees blossom and the herbs take off. Well worth a visit.